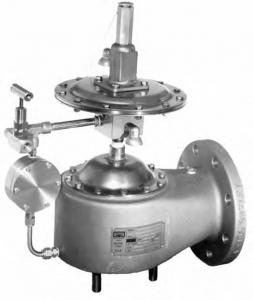 Pilot Operated Relief Valves serve the same primary purpose as pressure / vacuum relief valves, but with better performance characteristics than weight or spring loaded valves. Lower leakage and better flow performance make a pilot operated valve the solution when the focus is product conservation, expanded tank working band, and reduced fugitive emissions. A pilot operated relief valve provides the maximum available leakage control technology as specified in the Clean Air Act of 1990.
designed to provide emergency relief capacity beyond that furnished by the normal operating pressure relief valve on the tank. The valve protects the tank against rupture or explosion that could result from excessive internal pressures caused by an external fire, etc. Model 2500A is designed to be self-closing. As excessive pressure builds up, Model 2500A relieves, then reseats when over pressure has been dissipated. it is fully open at less than 10% above set pressure.